Students at Monmouth University were excited to spot the 'president' on Campus Tuesday. Alec Baldwin caused quite a stir on a New Jersey college campus when he appeared in his trademark President Trump costume. 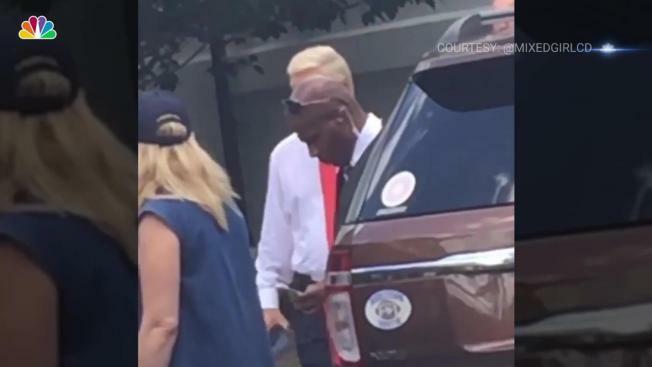 The "30 Rock" actor and recent regular guest star on "Saturday Night Live," visited Monmouth University Tuesday sporting his recognizable Trump wig and a red tie. Students who spotted Baldwin told NJ.com he was taking photos in front of Wilson Hall and Murry Guggenheim Library, fashioned to look like the White House. "Baldwin was in full Trump attire," 20-year-old senior Richard Felicetti told NJ.com. "Onlookers stood in the library parking lot and lawn as Trump exited the library, walked down the stairs and had a conversation with who I'm assuming was his faux security team," said Felicetti. The actor waved to onlookers, doing his classic Trump hand movements. Students thought he was taking photos for "SNL," but the university wouldn't confirm that to NJ.com.